This is a precise Sri Yantra cast in brass powder and glow dust. 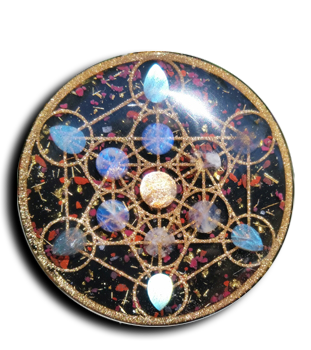 The body of the pendant is made with 23K Gold Leaf and Copper shavings, inside there are three Tibetan Quartz and the pendant is sealed on the backside with a Tesla Coil. It is inlaid with Shungite.